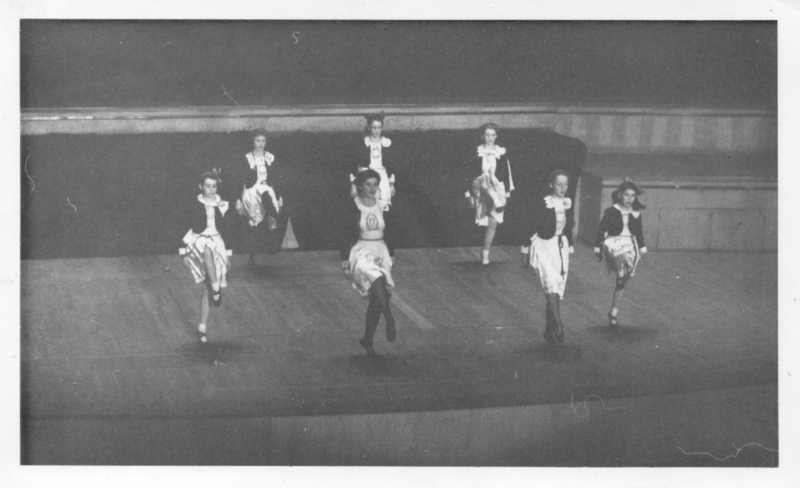 The Irish Dance troupe was founded in St. John's Parish in the 1946, following an appeal from the pulpit by Father Murphy, calling the young girls of the parish to come along to classes with a view to forming St. John's Irish Dancers. The Dancers marching behind the Band. 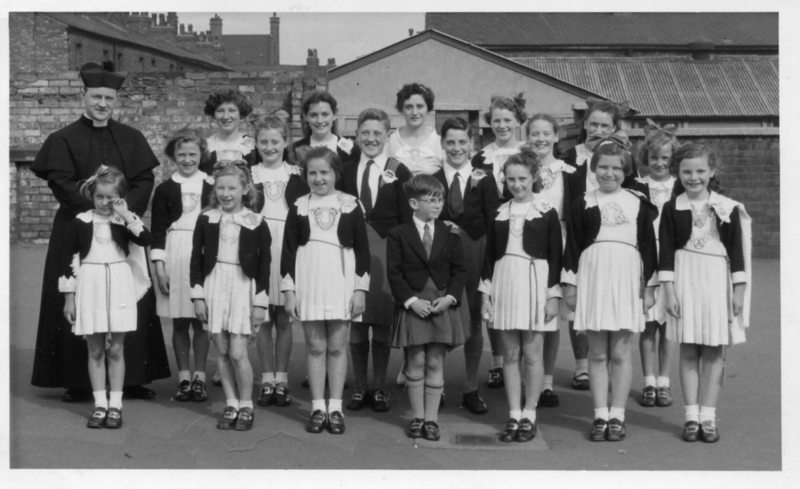 Thanks to Kev Parr for the photo (www.kevparr.com).Margaret Carroll, a young parishioner and primary schoolteacher by profession who had learnt Irish dance from a man of the cloth adept of the jig and the reel at St. Patrick's parish, Collyhurst, stepped up to teach the girls. 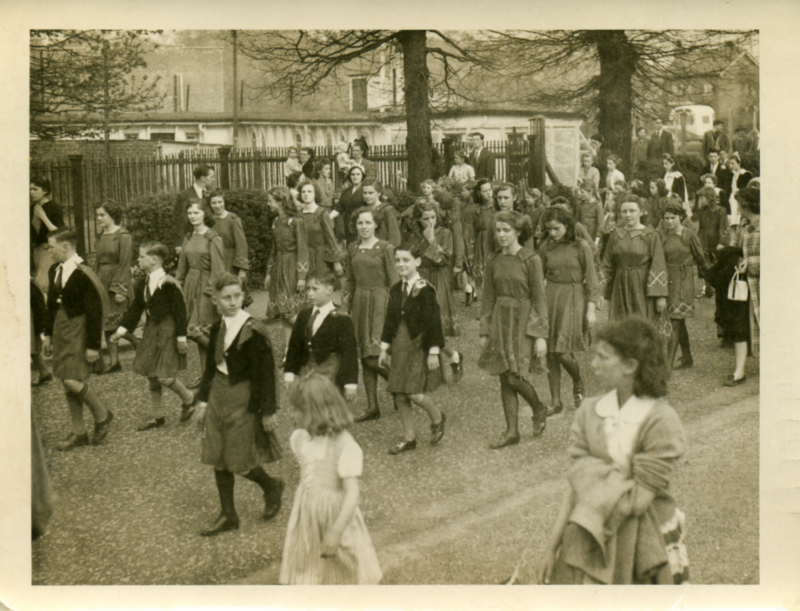 The classes, held each Wednesday evening in the classrooms of the adjacent St. John's Primary School, were an immediate success, and the young girls of the parish were soon ready to show off their footwork, much to the appreciation of the admiring crowds (see St. John's Parish Magazine, p. 19). 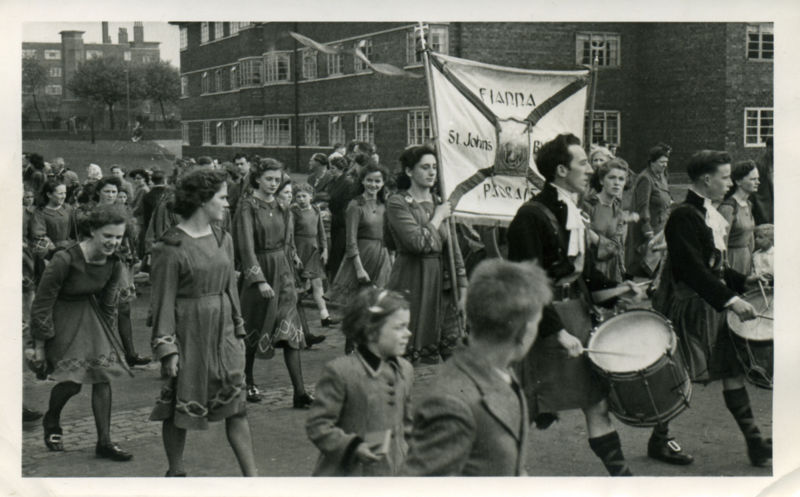 Under Margaret Carroll's expert tuition, the Dancers performed under the Fianna Pádraig banner, both with the Band and as a separate troupe. 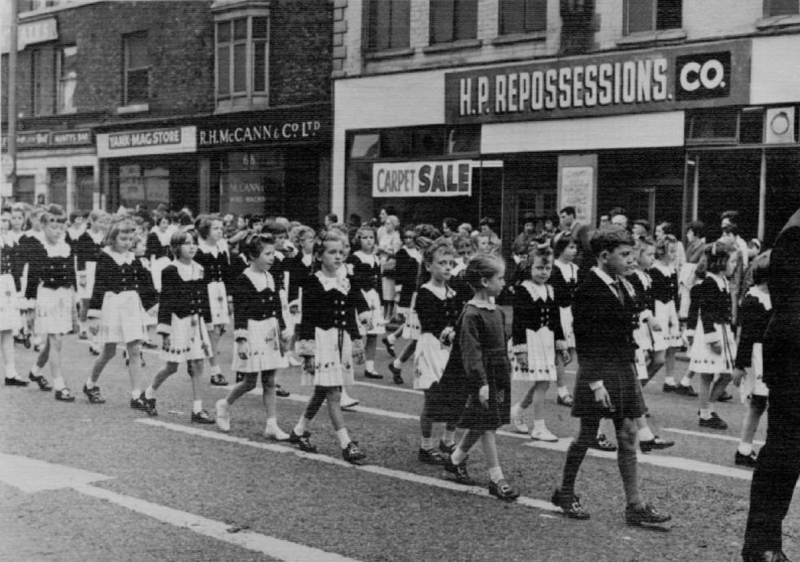 They were a great favourite at all manner of parish events, such as the St. Patrick's Day Concert held at St. Columba's School, and in the broader community, with a pre-match performance at Old Trafford, for example, as noted in St. John's Parish Magazine from March-April 1953, or indeed a show at Manchester's Free Trade Hall. 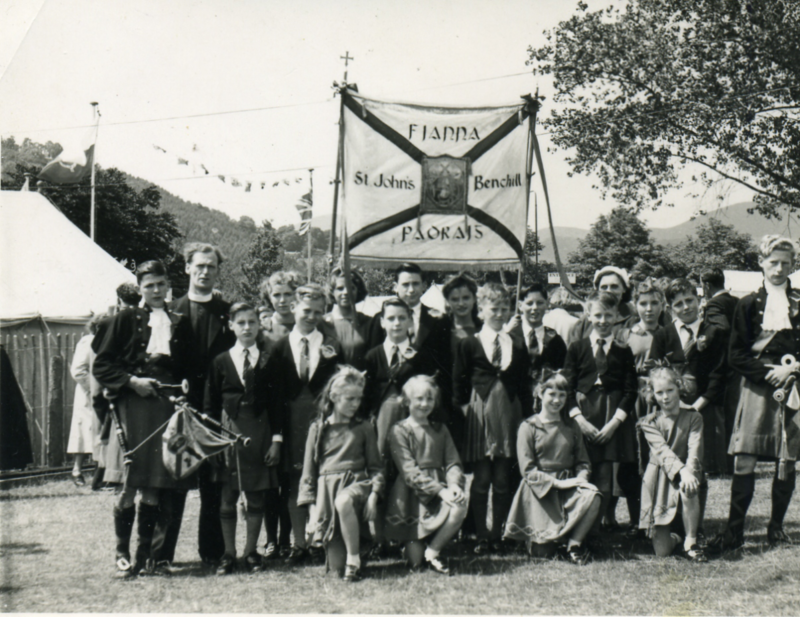 The Dancers gained the first of their many honours at the International Eisteddfod in Llangollen, North Wales, in the early fifties, when they were awarded first prize in their category at three successive editions. After Father Kehoe's appointment as Parish Priest of St. Anthony's in 1953, Mrs. O'Neal - as Margaret was then known following her marriage to Mr. Sean O'Neal, also a schoolteacher and, subsequently, headmaster of St. Paul's R.C. 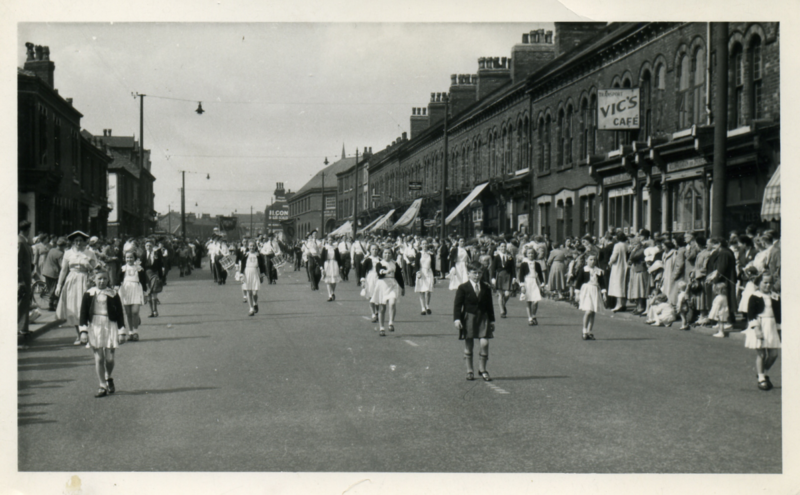 Secondary School, in Wythenshawe - took the dancers up Woodhouse Lane and Brownley Road to the new parish in Woodhouse Park. Mrs. O'Neal marching with her dancers at the Whit Walks. and Eamonn O'Neal for the photo.Classes were initially held in the "Green Hut" and then transferred to St. Anthony's Primary School once the school was completed in 1954. 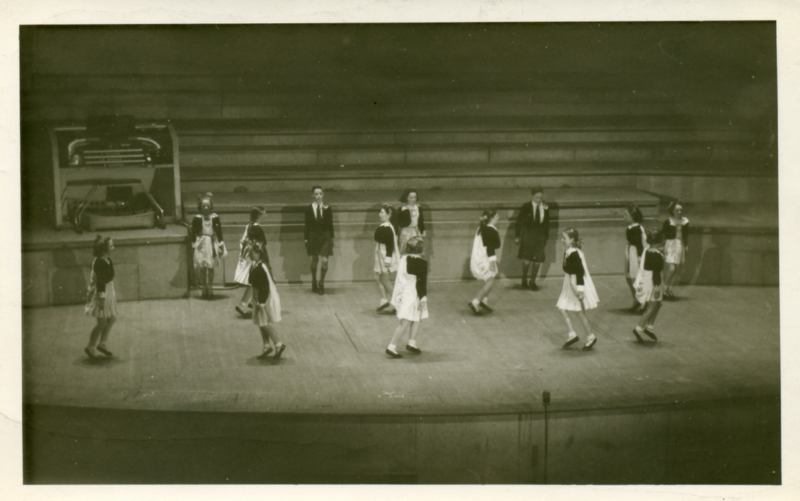 Over the years, the O'Neal School of Irish Dance maintained a close relationship with the band, the two groups performing together at a range of parish and local events. 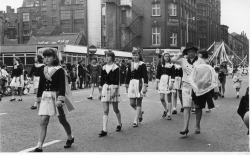 Throughout her career, Mrs. O'Neal taught successive generations of Irish dancers, both in the parishes and at the Gaelic League in Manchester. 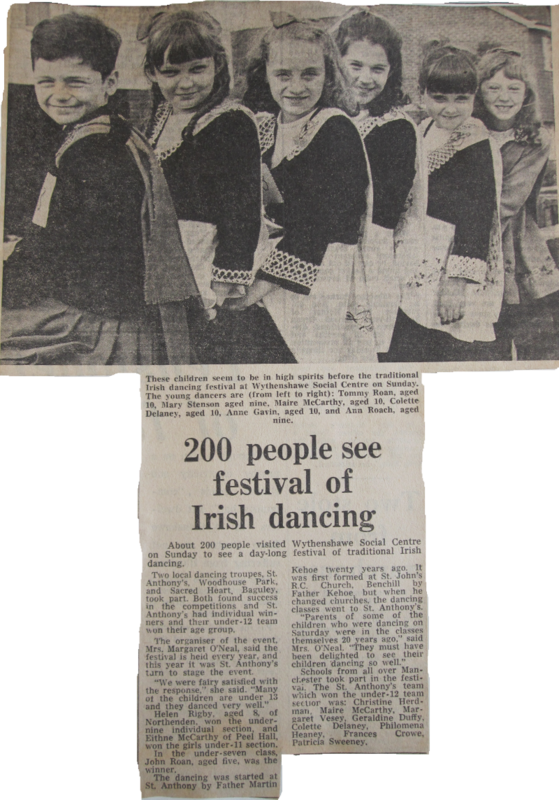 In an interview with the Wythenshawe Express in October 1972, on the occasion of a Festival of Traditional Irish Dancing which she organised at the Wythenshawe Social Centre (later renamed "The Terry Dowling Centre"), Mrs. O'Neal reflected, with typical modesty, on her long service to the community as a teacher of Irish Dance. "Parents of some of the children who were dancing on Saturday were in the classes themselves 20 years ago," said Mrs. O'Neal. "They must have been delighted to see their children dancing so well." My dancing career started when I was 5 years old. My parents took me with my brother and 3 sisters to Mrs Margaret O'Neal at the Gaelic League which was off St Peters Square. Manchester. We quickly picked up the steps and were soon winning numerous trophies and medals in Ireland as well as in England. Sadly, Margaret has now died but I will always teach in the same way that she influenced me. 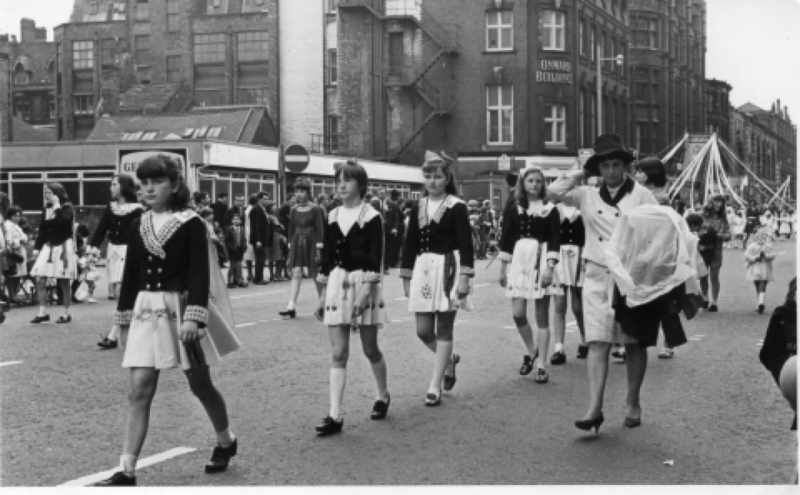 posted by Eileen Lally in October 2012, on IrishManchester.com (http://www.irishmanchester.com/memories.shtml) - permission pending. 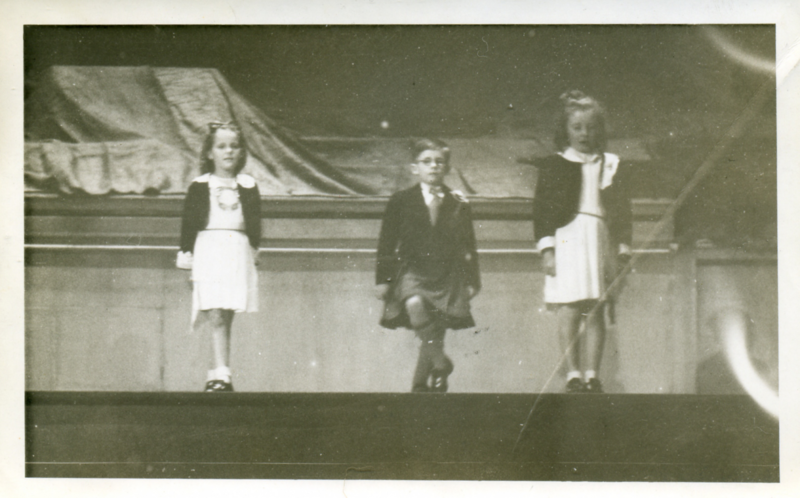 Barbara [Ahern] started dancing at about 3 or 4 years of age. 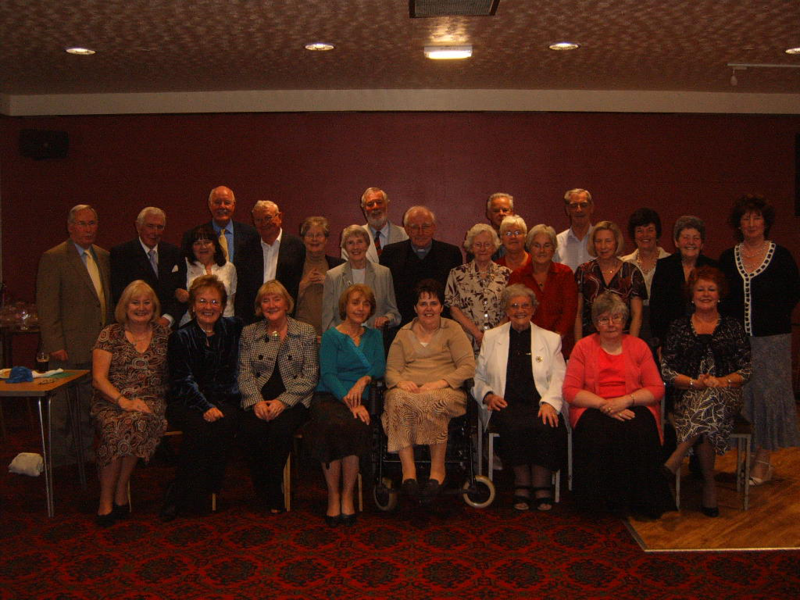 Barbara's mother took her to the Gaelic League in Manchester, where she learnt step dancing with Margaret O'Neal who was then Margaret Carroll. 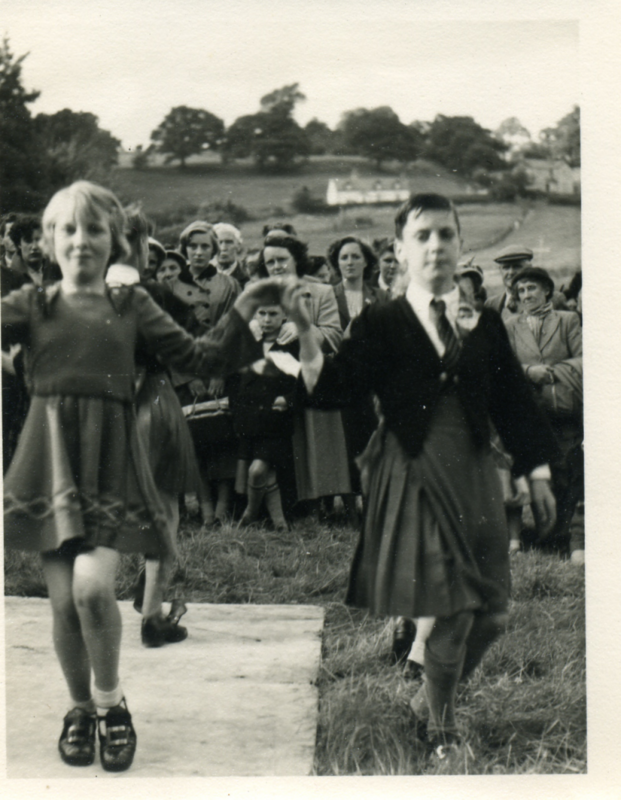 She also taught ceili dancing and Barbara learnt her first set dancing with Margaret. from Irish Set Dancing Workshops events page on Facebook (https://www.facebook.com/events/268305453183614/) - permission pending. But perhaps most importantly, from those very early days, in true Fianna P(h)ádraig tradition, grew friendships which were to last a lifetime. Indeed, until Mrs. O'Neal sadly passed away on 29th January 2010, many of her dancers from the fifties and sixties made a point of meeting up with their former dance teacher each year to catch up, reminisce, and reflect on past camaraderie and the legacy left for future generations to cherish. with Mrs. O'Neal on front row, third from right of photo. Click on a photo below to see a slideshow of photos of St. John's Dancers and the O'Neal School of Irish Dance. Our sincere thanks, once again, to Kev Parr (www.kevparr.com) and Eamonn O'Neal for the photos. Kev and Eamonn both feature in the slideshow. Can you spot them?